PLAY, LOUIS, PLAY! The Biography of Louis Armstrong as Told by His Horn! Louis Armstrong, the great Sachmo, was the world's most celebrated horn players. No one knew him better than the horn he played, the one he finally was able to buy from the pawn-shop. So, who better to tell the story of Louis's life than his beloved horn? 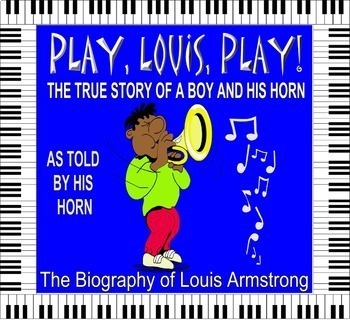 His horn becomes the voice of the narrator in one of the most entertaining biographies ever written, Play, Louis, Play: The True Story of a Boy and His Horn. Although it is an easy novel, we recommend it for grades 2-adult. 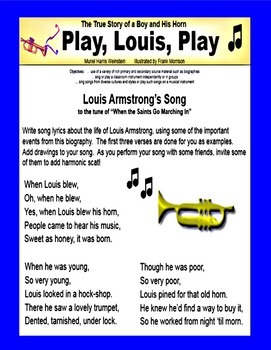 Make a Musical Instrument like Louis Armstrong did. 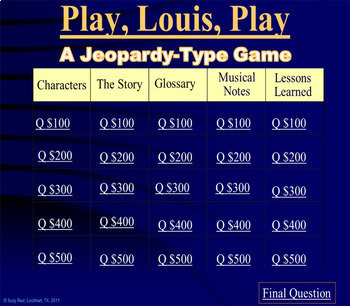 Plus, an interactive Jeopardy-type game in PowerPoint format! PLEASE NOTE: Kids Wings materials are written by highly experienced master teachers. We hire professional proof readers who are also master educators. 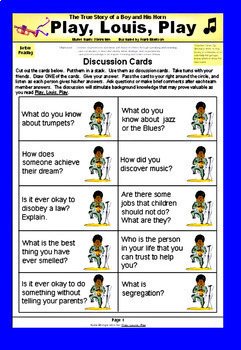 We do our best to be sure each of our literature guides is top quality and error free, and classroom tested, but if you think we can do better, we welcome your input. If you find an error in our materials, please email us at suzy@suzyred.com so we can make revisions. After it is corrected, we will invite you to download a newly polished copy and will probably attach a surprise to our reply as a thank-you!